Having started the Vanarama National League North season with a six-match unbeaten run, the Steelmen are now without a win in five after a late goal condemned them to a 3-2 home defeat to Boston United on Wednesday night. Corby now find themselves in 15th place in the table ahead of the clash with a Worcester side who sit second from bottom with just one win from their 10 outings so far. And Wright knows a victory of any kind is needed for his team whom he revealed were “feeling sorry for themselves” after their latest setback in midweek. 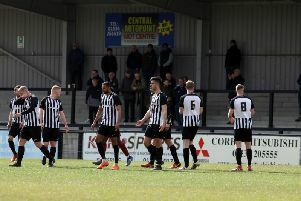 “I think this is the first time we have lost two on the spin since I have been in charge,” the Corby boss said. “We have also lost two home games in a row so we are obviously looking to get three points for as many reasons as you want. “We need to stop the rot, we need our form back at Steel Park but we just need a win. One real positive for the Steelmen on Wednesday was the performance of new loan signing Cedric Kipre, who partnered Duane Courtney at the heart of the defence. Midfielder Aaron Hassell, who like Kipre joined Corby on a youth loan deal from Leicester City, is also expected to be in contention for tomorrow’s clash. And Wright added: “Cedric looked the real deal. “He was strong, powerful, very good technically on the ball and he was a breath of fresh air. “Aaron has just come back from injury and played in a game on Tuesday.